Let’s face it. Not everyone can be as awesome as Geoff. I was properly introduced to Geoff via one of my professors at UCCS, a man named Tom Napierkowski. This was during my junior year, and one of the rare occasions when V and I actually had a class together. I learned a lot about classic literature from this class, and I started to learn more and more about the authors that I was studying. Now this was hardly the first literature class that I had taken where my professor was highly knowledgeable and very passionate about their particular subject. After all, it’s hard to argue with the people who wrote this or this. Still, my class on Geoff (for that is how Dr. Napierkowski will always refer to the man) was one of the first where I realized that I could understand my professor’s desire to know everything there was to know about a writer. It’s not just that Chaucer wrote fantastic pieces of fiction. The Canterbury Tales are still read and retold, over six hundred years later. It’s that Chaucer wrote incredible characters. The man understood other people. Want to get a handle on an ensemble cast centuries before Stephen King did it? 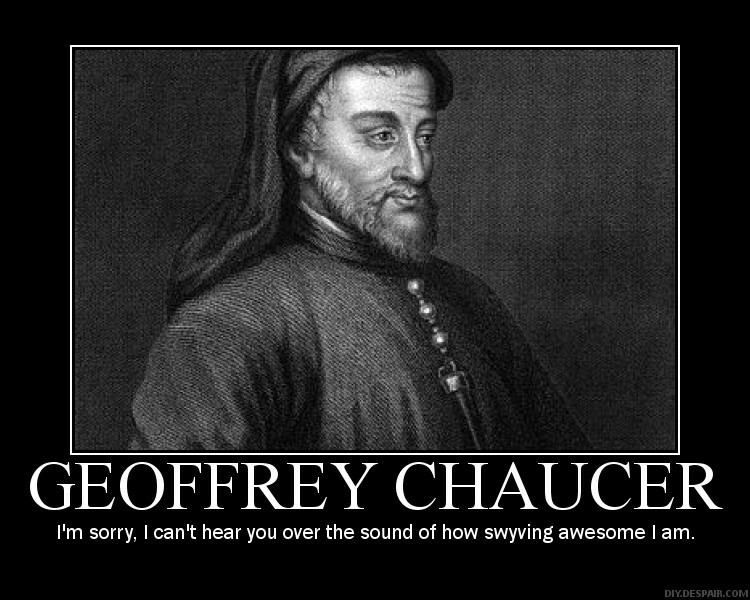 Read Chaucer. Every one of the characters on the pilgrimage to Canterbury has a story to tell, and each one of their tales reveals a little bit about who they are and what they believe. Whether it’s the noble Knight or the foul-mouthed, but funny Miller, Chaucer put in something for readers of every class and standing. He understood his audience, and he crafted something for everyone, and did it in a believable fashion. If that’s not a sign of an awesome writer, I don’t know what is. Unlike Dr. Napierkowski and V, I’ve not had the opportunity to swing by Westminster Abbey for a chat with Geoff. I’d love to find myself in Poet’s Corner, and just think about the great people that have been buried there since he was. That’s going to have to wait a little while, I’m afraid. For now, I’ll stow that goal away with all the rest, and try to do some writing that will likely pale in comparison. I had what I hope will be a great idea for a short fiction piece the other day, so I’ll be spending my free time today (so, you know, today) working on that and a load of job applications. If it turns out to be a long enough piece (1000 words or so), I may submit it to Chuck Wendig’s latest challenge, since I’m still waiting to see what Sonia‘s going to throw my way this month. No rush, Sonia, seriously. As for my reading, well, I decided to go with Larry Niven’s Ringworld to start, and snagged a copy of Fahrenheit 451 for the next reread, since those happened to be the two best titles in their respective shelves at the local branch of the public library. Halo fans take note. Ringworld is a huge inspiration to the titular Halo devices. Potential science issues (which have been addressed by Niven) aside, it’s shaping up to be a great sci-fi read. I’m sorry I didn’t get to it sooner, back in the days when I was first discovering things like Dune and Gateway and 2001. You’ll make it to the Abbey eventually, and the wait, however long it may end up being, will do nothing to diminish it. If I beat you back again, I’ll tell Geoff you said hey. Also, make sure to look behind the pile of folding chairs. That’s where they keep Milton. Yeah, you should have some time if you want to try to pull something together. Thanks for the tip for finding Milton. I’ll have to see him too.